Jane Austen, the seventh child of George and Cassandra Austen, was born on December 16, 1775 at Steventon, located in Hampshire in south-central England. Jane's father was a clergyman who was intelligent and in favor of education. He sent all of his six sons to school, and most to college. Even the two daughters were sent to a school in Oxford and later to the Abbey School at Reading; but at the age of nine, Jane left school and completed her education at home. Since Mr. Austen had a good library at home, the daughters were encouraged to read whatever they desired. Jane was also expected to acquire social graces, including being a good hostess, playing the piano, singing, needlework, and letter writing. The Austens were a close family, affectionate, lively and peace loving. They were great novel readers. Works of fiction were read aloud in the family. Jane was very much attached to her father and elder sister Cassandra. She had good rapport with her brother Henry, four years older than she. In fact, all members of the family were much attached to one another. Two of Jane's brothers joined the Navy, one joined the Church as a clergyman, one was adopted by wealthy relatives, the Knights, who were childless and became the heir to their property, one after a few setbacks joined the church and one remained sick all through his life. Jane did not marry because of her attachment to her father. She had romantic entanglements with at least four suitors. She accepted one suitor's proposal but then changed her mind and refused. She loved quiet home life and only visited her relatives and friends. So her life was spent in the countryside, in the company of few families and friends, with home or better still the drawing room as the chief object of Jane's close observation. Jane started her literary career at the age of seventeen. In 1794, she began her first novel Lady Susan. In 1795, she wrote Sense and Sensibility, at first entitled Elinor and Marianne. 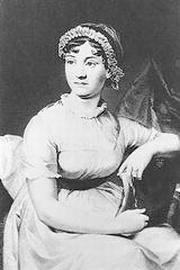 In 1796, she wrote First Impressions, which she later turned into Pride and Prejudice. In 1798, Jane began writing her third novel, which was published under the title Northanger Abbey after her death in 1818. In 1801, Jane found herself uprooted from the country of Hampshire when her father suddenly decided to retire and move the family to Bath, where the family lived for four years. Unhappy with her life in Bath, Jane wrote very little there. When her father died in 1805, she moved with her mother and sister to Southampton. In 1809, she returned to Hampshire and settled in the village of Chawton. Happy to be back in Hampshire, Jane began to write again and produced Mansfield Park, Emma, and Persuasion over the next few years. In May of 1817, Jane fell seriously ill and was brought to Winchester, where she died on July 18. Her body was laid in the north aisle of Winchester Cathedral. Jane Austen was born, lived, and wrote in the eighteenth century. During her lifetime, literature began to be influenced by Romanticism, where imagination, emotions, love for nature, and mystery are important. Although Jane Austen was a contemporary of romantic poets like Wordsworth and Coleridge, her novels are not romantic; instead she still belonged the age of reason and satire. The emphasis in her novels was on the manners of people in society, and she often criticized the snobbery of the British upper class, while upholding the ideals of self-control, reason, propriety, and etiquette in social manners. The subject matter of Emma is marriage from a woman's point of view, but Jane Austen does not treat it romantically. Instead, she presents, in a very realistic manner, the problems which young women of marriageable age in her times faced. Since women were unable to have a career, Austen showed how women sought a comfortable home and economic security through marrying properly. Marriage, for Jane Austen, is a means to study human and personal relationships. There are three proposals of marriage in the novel, and each of them reveals much about the characters involved. Robert Martin proposes to Harriet Smith through a letter, and she also declines in a letter. Elton's proposal to Emma is made in a carriage in the most conventional manner with his trying to be the adoring lover; Emma's bewilderment over the proposal, however, makes the moment very unromantic. Knightley's proposal of marriage to Emma is not a romantic expression of love, but a proposal that is marked with reason and common sense. Jane Austen knew her limitations. She could never write about the thrilling and exciting moments in a romantic way; instead, her interest was in psychologically analyzing the consciousness of her characters in common settings. The end of the eighteenth century saw the outbreak of the French Revolution and the Napoleonic Wars; it also saw the industrialization of England. Although Jane Austen knew about these historical and political events showed, she showed no interest in them, and they play no real part in her writing. Instead, she focuses on rural society and the relationship of people, writing with a limited scope. This is the world she knew, for she lived most of her life in Hampshire, in villages very similar to Highbury. Her love of this setting is very clear in Emma.